At ground zero of the controversy is UW graduate James Chatters, who earned his doctorate in anthropology in 1982. As the first anthropologist to study the remains, it was Chatters who dropped the pair of bombs that ignited the ongoing controversy. Appearing at a press conference in Kennewick in August 1996one month after the skull was discovered and numerous other bones retrievedChatters announced the skeleton was approximately 9,000 years old and displayed "Caucasoid," not traditional Native American, features. From that moment on, "everything went crazy," recalls Chatters, who says he's now regarded as either "a hero ... or the anti-Christ" for his handling of the remains. Chatters had managed the cultural resources program at the Pacific Northwest Laboratory in Richland before leaving to start his own business, Applied Paleoscience. He also occasionally volunteered to examine human remains for the Benton County Coroner. That is how Kennewick Man fell into his handsas the subject of a forensic exam. What happened during the month Kennewick Man was in Chatters' custody set the dominoes in motion for everything that followed. While Chatters maintains all of his actions were "above board," his critics accuse him of trampling the spiritif not the letterof federal law. The primary law governing the case is the Native American Graves Protection and Repatriation Act (NAGPRA). Passed in 1990, it requires Indian remains and artifacts found on federal land to be returned to the appropriate contemporary tribeprovided the tribe has an affiliationsuch as biological, cultural, historical, archaeologicalwith the bones or objects. Native Americans consider the remains of their ancestorsno matter how ancientsacred. "The process of the passing of this life into the next is a very significant one," says Van Pelt. "And that process is interrupted when the bones are uncovered." On the face of it, the law would seem to be a thorn in the side of scientists, handcuffing their ability to thoroughly test and examine important discoveries. But Stein, a UW anthropologist and divisional dean of computing, facilities and research, is among those who take a different view. 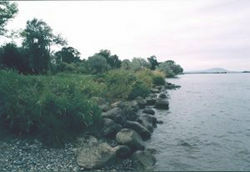 Kennewick Man's remains were found in 1996 along the bank of the Columbia River near Kennewick, Wash. The Army Corps of Engineers has reburied the site, seen to the right as it appears today. "What NAGPRA has started among archaeologists is a culture of consultation that almost no project ... is started without involving Native American people," she says. "It wasn't perfect, but we were going in the right direction. Tribes were beginning to trust us and archaeologists were beginning to have relationships with these tribes that were close. "The Kennewick controversy set that process back." Right from the get go, one provision of NAGPRA definitely applied to Kennewick Man. The remains were found on federal land. But were they Native American? Chatters first guessed they belonged to a white settler. The condition of the bones ruled out a contemporary subject and the elongated skull did not match the rounder shape typically associated with American Indians. However, after collecting and examining the rest of the skeleton, Chatters found something unexpecteda stone spearpoint, potentially thousands of years old, lodged in a pelvic bone. Odds were he no longer was dealing with a white settler. And if Kennewick Man wasn't a white settler, what else could he be but a Native American? And wouldn't that mean his remains were protected by NAGPRA? For Seattle Weekly staff writer and UW grad Roger Downey, '65, the question was "what did Jim Chatters know and when did he know it?" 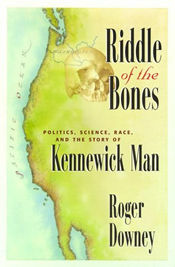 Downey traced the twists and turns of the Kennewick Man case in a book published earlier this year called Riddle of the BonesPolitics, Science, Race and the Story of Kennewick Man. Riddle of the Bones grew from a piece Downey wrote for EastsideWeek after Peter Ward, a UW paleontologist and friend of Downey's, sent the story to a publisher with the suggestion that it would make a good book. Downey says he was "gratified" by the Interior Department's finding that the remains belong to the Confederated Tribes of the Umatilla. "In this case, it was the best decision they could reach under law," says Downey. "However, it doesn't do anything about the squalid history of the case."